Students from all over central Vermont are able to spend one day a week outside, learning many life skills that they normally wouldn’t experience in a classroom setting thanks to EarthWalk Vermont. There’s no denying, kids love field trips. Any excuse to get out of school for a day is usually good enough for them. But what about spending one day each week outside in nature, where kids can learn how to build a shelter, start a fire, discover where medicines grow, and whittle and carve things with knives after passing a knife safety test – all done to complement regular classroom learning. These “irreplaceable hands-on experiences” are exactly why Angella Gibbons, a nature educator for 28 years, founded EarthWalk Vermont 11 years ago. EarthWalk differs from environmental education, where kids might go on field trips for a couple hours. EarthWalk is based on long-term mentoring. As part of EarthWalk’s Village School and Teen Land Project, students spend one full day a week in Hawthorn Meadow behind Goddard College in Plainfield, in place of a day of classroom instruction. Mentors and staff plan half the day. The rest of the day’s lessons unfold depending on the weather or what the students are interested in that day. “The kids really direct their learning here,” Gibbons said. Gibbons started EarthWalk in 2005. It was difficult at first, convincing schools’ administration to allow students to miss a day of school each week to spend it outdoors instead. Now in its 11th year, EarthWalk is more settled. The program has about 75 students who come out each week for a full day of learning. There are separate programs for kids 6-12 and for teens. EarthWalk works with about 25 different towns and eight or nine schools, according to Gibbons. Montpelier Union Elementary School is one of the main schools the students come from along with many of the elementary schools in the central Vermont area that tend to act as feeder schools for U-32 High School. About 65 percent of the students in the Village School program come from public schools. EarthWalk also works with home schooled students. The programs run for about 34 weeks during the school year. Scholarships are also available. No student will be turned away due to lack of funds. There are also summer programs as well that run for one week, two weeks or overnight. There are eight weeks of camps. Teenagers learn how to build a shelter and stay outside all night without a sleeping bag, which Gibbons calls a real confidence builder. EarthWalk is very entrenched in the central Vermont Community. The organization recently hosted open houses to showcase its Village School and Teen Land Project programs. But if you’re an adult and are wondering what there is for you, don’t worry. Gibbons said she is really excited about the Adult Field Institute. There are monthly workshops on fire making, tracking, making cordage, learning about roots and polypores, different medicines, and more. 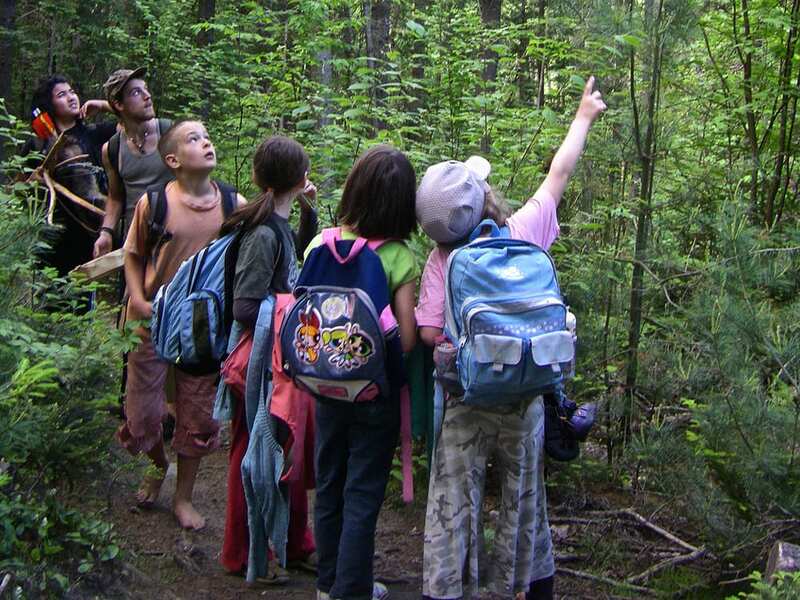 The Field Institute offers a yearlong program called Nature Mentoring Certificate for educators who want to connect children with nature. Attendees can receive undergraduate and graduate credit for that program. It’s truly a special organization where kids can participate until they age out of the programs and then come back to EarthWalk as mentors, where they then educate the next generation of learners. And after 11 years, Gibbons said that she can now measure the success of EarthWalk. She said kids who participate in the Village School program tend to get better grades in school, are up for more challenges, and even get along better with siblings. “It’s a special community where they’re really learning to care for each other,” she said. For more information, head out to Winter Community Day or check out https://www.earthwalkvermont.org.